Your Vive has been preordered. You are trying to wait patiently. How about you distract yourself with a project? 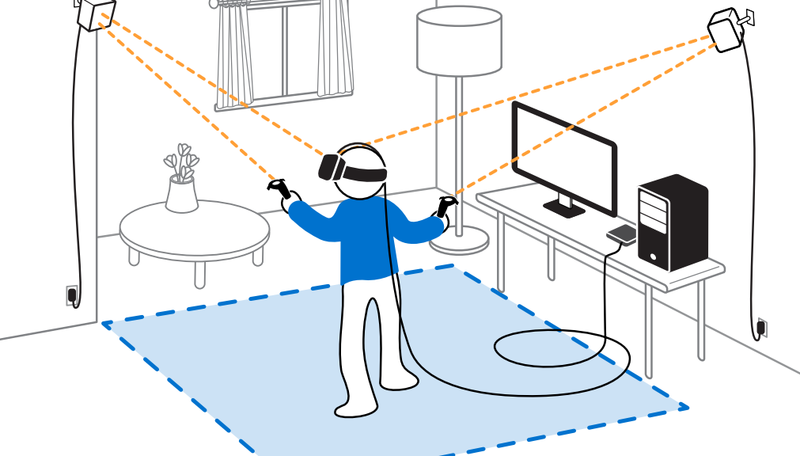 Let’s get your VR space setup! 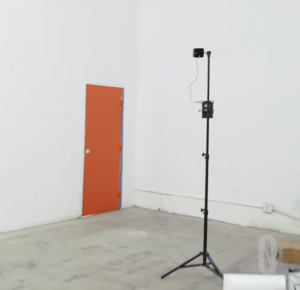 Setting up a room-scale Vive VR space isn’t as simple as you think. Plugging in the headset is the easy part. Moving furniture and barricading pets shouldn’t be too hard. The tricky thing will be locating and mounting the Vive base stations so that they’re functional but still out of the way. 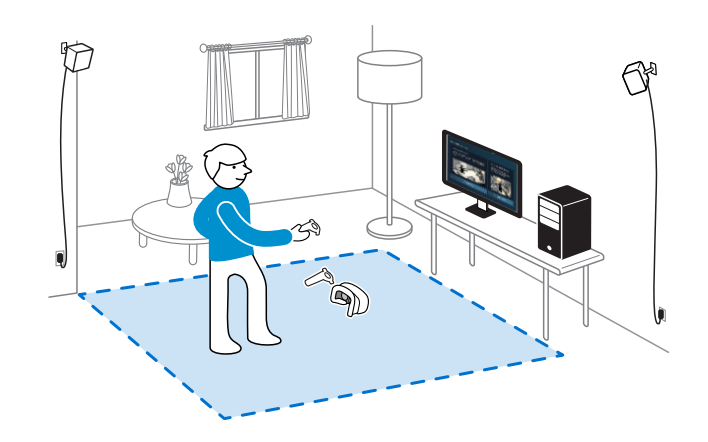 The Vive Pre User Guide has a detailed explanation of setting up your VR space. Let’s start from the beginning! 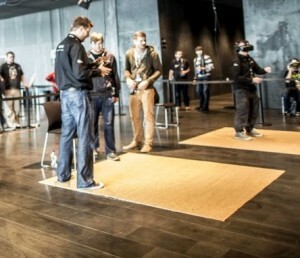 I would recommend laying down a nice square rug to claim your VR space. This will provide a nice visual indication of your area for those around you. It will also provide some tactile feedback for the space boundary when you have the headset on. 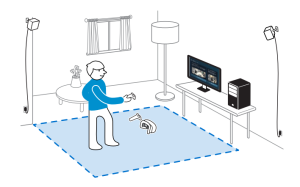 The Vive base stations need to be mounted diagonally across from each other and mounted above your head level. They also must be solidly mounted so that they won’t vibrate or wobble. Each base station needs to be plugged into an electrical outlet and will be powered on automatically via Bluetooth LE. The base stations also come with a sync cable but it shouldn’t be necessary in most mounting situations. There are a few different ways to mount the base stations. Each base station comes with a 1/4″ standard tripod mount in the bottom and rear of the unit. 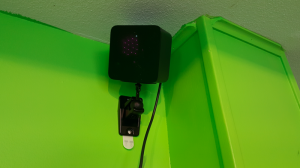 A more permanent solution is to directly mount the base stations to your wall using the included brackets (consumer version to be determined) and drywall anchors. If you’re not thrilled with the stock mounts any set of threaded speaker mounts should work. If you don’t want to drill any holes a less permanent solution is to mount the base stations using 3M Command tape. A word of caution, this is not proven to be a long-term solution – vibration from the base station may eventually loosen the tape. If you don’t want to mount anything to your walls then consider using tripods to mount your base stations. These are a little more obtrusive when set up but can be easily disassembled and put in a closet when not being used. A smaller tripod can be setup on your desk or book shelf while a taller light tripod can be located in a corner and still reach above head level. The smaller tripod has a head that can pivot to aim the base station but the larger tripod will likely require a separate pivoting tripod mount. If you’re interested in something less obtrusive than a tripod you can also consider a floor to ceiling tension rod. A vertical tension rod will easily fit into a corner and shorted version can fit horizontally into alcoves or window frames. Use a pipe clamp tripod mount to position your base station freely along the length. That should be everything you need for a great VR room! You have a lot of options for mounting your base stations and many people will mix and match solutions for their own space. Start building your VR room now!